The future campus of Cristo Rey Jesuit High School Milwaukee is located at 1818 W. National Ave. in the Clarke Square Neighborhood. Photo by Adam Carr. South Siders are looking forward to welcoming students, educators and administrators from Cristo Rey Jesuit High School to Clarke Square. Cristo Rey recently purchased and will renovate a former Pick’n Save grocery store located at 1818 W. National Ave.
Ian Bautista, executive director of Clarke Square Neighborhood Initiative, said he is glad that Cristo Rey is moving to the South Side neighborhood and that the grocery store building will not remain vacant. “It’s a very productive and positive use of what is now a largely vacant space. To take 120,000 square feet and fill it up with educational activity and development, that’s definitely positive,” Bautista said. The community will benefit because the school will also bring people in to support local businesses such as El Rey and Gloria’s Cake Shop and Café, Bautista explained. Ian Bautista, Clarke Square Initiative executive director, says Cristo Rey’s move is good for the neighborhood. Photo by Raina J. Johnson. 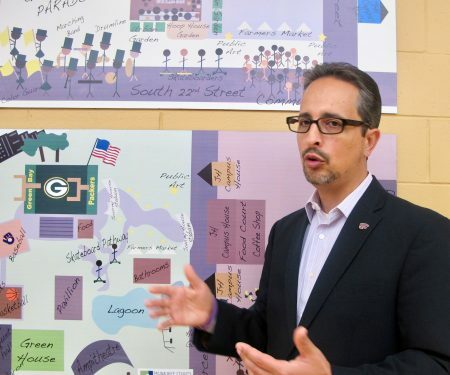 “When you think symbolically about the health of a neighborhood, having a high school is very meaningful because it gives the neighborhood a better sense of identity,” Bautista said. He mentioned that a Cristo Rey student is interning at Journey House, which houses CSNI. Bautista also said that Cristo Rey is a respected institution, and it’s good to have a high-quality education system come to Clarke Square. Cristo Rey’s current location is in West Milwaukee at 1215 S. 45th St. The school focuses on connecting its students with internship and work-study opportunities in the Milwaukee area. School officials announced that they expect the new school to open in fall 2019. It will enroll about 500 students on an ongoing basis. Tracy Josetti, managing director of development for Cristo Rey, said the school evaluated several locations and the former Pick ‘n Save building was the best. “We liked the idea of being within reach of Marquette University. We liked being close to the public parks systems, and near the Domes,” said Josetti. Cristo Rey also chose the location because it’s near major roads and highways that provide easy access to transportation routes for faculty, students and families, in addition to safety and security features, Josetti said. She added that the new space is more than twice the size of the school’s current 45,000-square-foot location. The renovations are projected to cost $20 million, but that number could change since the project is still in the infancy stage, said Josetti. Fundraising will begin in early 2018, she added. 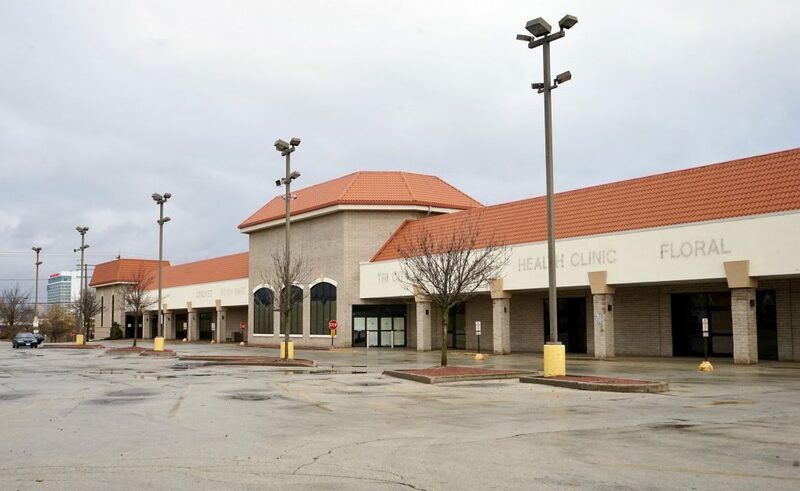 Tammy Rivera, executive director of the Southside Organizing Committee, said community members were disappointed to see Pick’n Save leave, but are pleased that the building won’t remain empty. Rivera added that it is too soon to know the impact the school will have in the community, but said she is glad to see that Cristo Rey is committed to social justice. She said she hopes the school community will engage with residents, and looks forward to working with Cristo Rey and its students on issues of social justice. She would like to see the school’s leadership and students reflect the diversity of the surrounding community. Gloria De Angelo, owner of Gloria’s Cake Shop and Café at 2531 W. National Ave., is unsure how Cristo Rey’s arrival will affect her business, but said she hopes the school brings in new customers to her shop, located a few blocks west of the school. “I do have a lot of [choices] that kids might like,” said De Angelo, mentioning chocolate, coffee and cakes. She added that the store has Wi-Fi so students could do their homework there. She agreed that it’s good for the community that the building will not remain empty.